ST/SC Corporation Loan Online in Karnataka State: Corporation loan can be defined as a loan that is given to a company, rather than to a government organization or an individual person. So as we know that these days it is quite impossible to start a business of its own without taking any help from banks or other people. Especially, people who belong to SC/ST caste, they can't even afford a little amount of money to start a business or to start a shop of their own or for any other small business. So for them, Karnataka government has started a Corporation loan in 1975. This scheme will help these poor people to start their business, or to build their own home and other things. In our article ST/SC Corporation Loans in Karnataka, we will tell the procedure and eligibility criteria for every group. These are the schemes Karnataka government providing: self employment scheme, land purchase scheme, Ganga Kalyana scheme, micro-credit finance (kirusala), micro-credit scheme (nscfdc), safai karmachari rehabilitation programme. For Scheduled Caste (SC) people, Karnataka government has started a new scheme as SC Corporation Loans in Karnataka. Under this scheme, people who belong to this SC group can easily get a loan for themselves. This will help these guys to develop themselves in a better way. Their growth rate will increase and they can compete with this advanced tech world. We will let you know all about this SC Corporation Loans in Karnataka, the eligibility criteria, application form and required documents here. * You need to have Aadhar Card to start the application. * Date of the birth certificate should be there with you like you can have an original certificate, or you can show your 10th class admit card as there they mention Date of Birth. * You should have the community certificate that you belong to this SC group. * You need to have your passport size photo with you. * You need to have a proof that you belong to this SC group. * You must be 18 yrs. old at least. * You should not possess a great amount of money with you. * And you will need to show the government that you really need this loan. For Scheduled Tribe (ST) people, Karnataka government has started a new scheme as ST Corporation Loans in Karnataka. Under this scheme, people who belong to this ST group can easily get a loan for themselves. This will help these guys to develop themselves in a better way. Their growth rate will increase and they can compete with this advanced tech world. 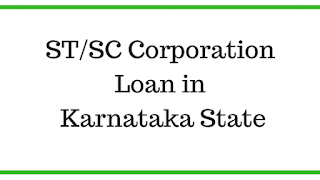 We will let you know all about this ST Corporation Loans in Karnataka, the eligibility criteria, application form and required documents here. * You should have the community certificate that you belong to this ST group. * You need to have your income certificate with yourself. Like people who are working in a company they can easily provide this, but those who don't work in a company they can just give a letter signed by the authorized person. * You need to have a proof that you belong to this ST group. Just follow these procedures and steps and you will easily finish applying for ST/SC Corporation Loans in Karnataka. So just read this article and make sure you apply for a loan with ease if you need it.